Bart gets a stomachache after accidentally eating a jagged metal Krusty-O with his breakfast cereal. Lisa is the only one who believes him, however, and Homer and Marge send him to school. Bart struggles through the test, and after finally convincing Mrs. Krabappel that he is actually ill, she lets him go and see the nurse. Bart collapses on the medical room floor, and is taken to Springfield General Hospital where he undergoes surgery from Dr. Hibbert and Dr. Nick, as it emerges he has appendicitis. While visiting Bart in the hospital, Lisa meets her hero, jazzman Bleeding Gums Murphy, in a bed in another ward. This was a notable episode. 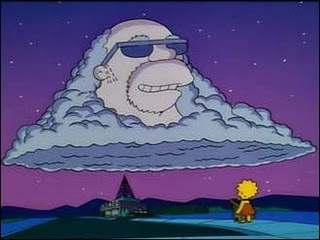 Bleeding Gums Murphy became the first recurring character to be killed off in The Simpsons, just one of an untold number of demonstrations the show has given over the years of its capacity to transgress expectations, not only of what we expect from cartoon animation but also within the conventions of storytelling. What is typical about the above plot set-up for “‘Round Springfield” (the title makes oblique reference to the Thelonious Monk composition, ‘Round Midnight) is that the main narrative in the episode is only signalled by the final sentence of the paragraph. This device – “The Simpsons Plot Detour” – has not, to my knowledge, been given due acknowledgement in critical texts about structure in fiction so I have no idea if anyone has given a name to the device. If you know of any writing on this subject, I’d be grateful to hear about it; if not, I’m calling it for The Simpsons Plot Detour (SPD). The SPD will allow us to become involved in a storyline – here, the box of cereal, the metal Krusty-O and Bart’s hospitalisation – through regular functions of linear narrative: establishing the setting (home) and central characters (Bart and the family); introducing the motor for the plot (the cereal); and engaging our emotions in the plot developments that follow (Lisa standing up for Bart; Bart’s struggle with the school test; the anxiety of the operation). At this point, the detour occurs and Lisa’s wander down the hospital corridor takes us to the bedside of Bleeding Gums. The story that will unfold for the remainder of the episode is now one in which the story dynamic is the relationship between Lisa and Bleeding Gums, his mentorship of her, even from beyond the grave, and her advocacy to keep his memory alive. It’s a disruption of narrative convention but we’ve learned to accept it because it’s The Simpsons and that’s the way they tell stories. As it happens, the misdirection of Bart’s encounter with the metal Krusty O isn’t completely discarded. He goes on to earn compensation money, which helps Lisa to purchase Bleeding Gums’ only LP, and so that eventual sub-plot manages to serve the main narrative. In the same way, Bleeding Gums’ celestial reappearance to Lisa has resonance with the story that is the main reason for this post. Nevertheless, I bring up the structural device of the SPD solely as a means of arriving at this instructive point: the decisions you make about the structure of your story are as important as the idea for the story itself. This week, the short story specialists, Comma Press, have been pushing their call for submissions to their next anthology, The Reveal. Previous anthologies, drawn from open submissions, have presented an over-arching theme within which the writer needed to work. Although largely commissioned, some of the stories in the 2009 anthology, Re-Berth, including my piece, Scent, came from a submission process. The theme was “Cities On The Edge”, itself the theme of a civic, commercial and cultural partnership between the six European port cities represented in the book. So writing the story involved first solving a puzzle as to how to make this a Liverpool story, a story about being “on the edge”, being marginalised in some way, and a story that I would be able to tell. The remits from publishers and competitions can appear daunting or irksome but they can often provide the pinch of sugar needed to activate the yeast. An idea or even a whole draft that may not quite have been coming to life can, with the introduction of this new imperative, suddenly start to breathe. Rather than a theme, the publishers here are building their anthology around a structural device: the “reveal” of a disguised narrative (not a surprise twist) at the denouement of a story. What Comma has recognised is the role of structure in making a story work. Structure is about how you organise the storytelling and this, in turn, encompasses factors such as the chronology of the narrative and the Point of View. When he emerged in the 1990s. one of the aspects of Quentin Tarantino’s film-making that showed off his cineaste credentials was his approach to structure: the three-card trick of shuffling the heist movie plot strands in Reservoir Dogs so that the heist itself was never shown; the even more radical liberties taken with linear structure in Pulp Fiction (whereby John Travolta could be killed off a third of the way through and then reappear in a different, earlier episode placed at the end of the film); and, in Dusk Till Dawn, for which he wrote the screenplay, the near-Simpsons Plot Detour of a road movie turning into a vampire flick halfway through. Making the audience or readers think about how the story is being told freshens the information you present to them. The “it was all a dream” ending Comma outlaws, on the other hand, can make previously fresh narratives seem tired, as can the structure of “thing that’s happening now – extended flashback to explain in a wholly linear fashion what has happened before now – back to the now to end with a platitude about what has been learned from the experience” that should make readers weep with rage if they encounter it from a professional writer. Point Of View (POV), similarly, can coax unexpected depths from material that might otherwise belong on charity shop bookshelves next to hastily-discarded paperbacks by breakfast TV presenters-turned-authors. It’s important to think about POV not simply as the voice chosen to tell the story. In relation to the way the story’s information is structured for the reader’s absorption, it’s also about the level of knowledge about events in the story and life beyond it, and the emotional and intellectual perspective from which it’s told. I know every inch of Christina’s body and mind, each sensation, each mood. I know every one of her likes and dislikes, her favourite band, the place on her neck where she likes to be touched when a man is kissing her. I know the exact strength she likes her coffee and the words her grandmother whispered to her in the hospital just before she died. I also know the effect the handful of bitter pills will have on her physiology after she swallows them. I know every name of every chemical Christina will synthesise as each complex molecule of each pill starts to bond with receptors in her weary, stricken brain. Yes, we angels do dance on pinheads, and the usual number we fit on is one-hundred and seventy six for a standard gauge pin. This is not because of some restriction in size. As I say, we are entirely immaterial. It’s just that for pin-head dancing, one-seven-six just feels like the right number. Call it tradition. 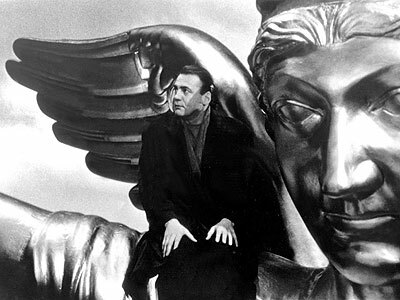 There are parallels with Wim Wenders’ 1987 masterpiece, Wings Of Desire and its tender images of Bruno Ganz and Otto Sander resting their heads on the shoulders of Berlin residents and thereby hearing their thoughts, in the loving devotion, the “almost luminous love”, our narrator has to Christina. The contrivance of the Angel’s POV – and the further contrivances this then works into the plot – allows Kunzru to make a distinctive statement about a woman like Christina, whose low self-esteem, poor body image and weepy vulnerability to awful men would make her a Chick-lit cliché. She is beautiful. There are no qualifying remarks to add to that fact. Kunzru uses the trappings of religious imagery to lead us to this understanding but the fundamental device here is literary – the title is, of course, the name of a literary device. This is a story that puts us back in touch with the core of our humanity. Christina’s redemption is from the mediated ideologies that distract and diminish us. It shows how love is the tool we’ve found and named for the impulse to save, preserve and celebrate our lives. And it’s a message that gets across because the story structure, for all its transcendental flourishes, shines a true spotlight on the moments that we can recognise from our real lives.